“It’s been absolutely heinous. These flies are invading my space and it makes me feel gross.” –Bryan, Texas Resident Shannon Wolfert. 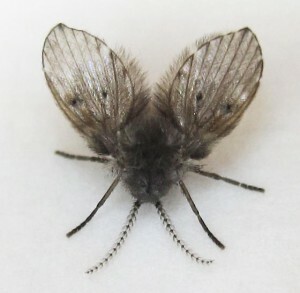 The story that we’re excerpting below concerns the invasion of a neighborhood in Bryan, Texas by dreaded filter flies, aka drain flies, sewer flies, moth flies. Filter flies, as you might guess, are called filter flies because they love to congregate around water filters. Not the water filter under your sink, but a specific type filter used in wastewater treatment that is called a “trickling filter.” Here’s a good explanation of a trickling filter and how it works. A trickling filter consists of a bed of highly permeable media on whose surface a mixed population of microorganisms is developed as a slime layer. The word “filter” in this case is not correctly used for there is no straining or filtering action involved. 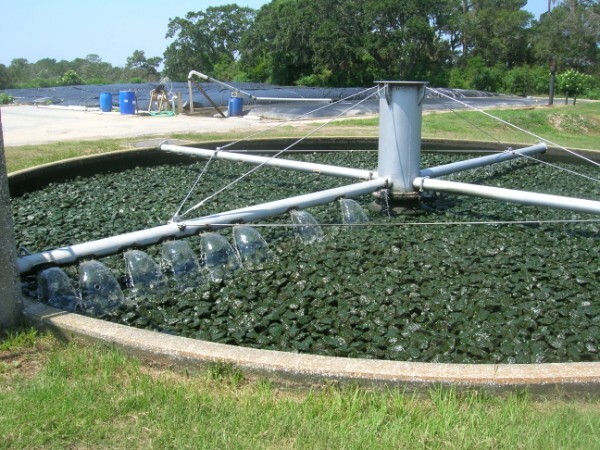 Passage of wastewater through the filter causes the development of a gelatinous coating of bacteria, protozoa and other organisms on the media. With time, the thickness of the slime layer increases preventing oxygen from penetrating the full depth of the slime layer. In the absence of oxygen, anaerobic decomposition becomes active near the surface of the media. The continual increase in the thickness of the slime layer, the production of anaerobic end products next to the media surface, and the maintenance of a hydraulic load to the filter, eventually causes sloughing of the slime layer to start to form. This cycle is continuously repeated throughout the operation of a trickling filter. For economy and to prevent clogging of the distribution nozzles, trickling filters should be preceded by primary sedimentation tanks equipped with scum collecting devices. Primary treatment ahead of trickling filters makes available the full capacity of the trickling filter for use in the conversion of non-settleable, colloidal and dissolved solids to living microscopic organisms and stable organic matter temporarily attached to the filter medium and to inorganic matter temporarily attached to the filter medium and to inorganic matter carried off with the effluent. The attached material intermittently sloughs off and is carried away in the filter effluent. For this reason, trickling filters should be followed by secondary sedimentation tanks to remove these sloughed solids and to produce a relatively clear effluent. It is easy to see how flies might develop a liking for a trickling filter, and the fact is that filter flies sometimes become such a nuisance that the filter has to be shut down to get rid of them. Control of filter flies other than by turning off the filter is difficult because many traditional remedies don’t work well. If chlorine is used to kill off the flies, for example, it also kills off the bacteria that make the filter work. When a trickling filter is shut down, unfortunately, the filter flies don’t vanish. They just move. The piece below describes what happened when a trickling filter was shut down at the Bryan, Texas wastewater treatment plant. — Hardly Waite. A swarm of flies that bred in Bryan’s wastewater treatment facility has led the city to shut down a part of the system, prompting complaints as the insects quickly spread into the nearby neighborhood. “I’m not going to say it’s been biblical conditions out there, but it’s been pretty heavy,” said Mark Jurica, Bryan’s treatment and compliance manager. About a month ago, moth flies — also known as filter flies, drain flies or sewage flies — were seen at the trickling filter in Bryan’s wastewater treatment facility. After chlorine and fogging sprays failed to kill them fast enough, city officials were forced to turn off the filter. The trickling filter is a 100-foot tank filled with rocks. While the filter is a cost-efficient way for the city to strip organisms from the water, its humidity and water also is a perfect breeding ground for the moth flies. Shutting it down has eliminated the fly’s habitat and food supply, forcing them out of their homes and into the city. The facility is near a residential area that includes Royal Oaks Gardens apartments, where the flies can be seen coating walls inside some apartments. Shannon Wolfert, who lives at the complex off Carter Creek Parkway, said she started noticing flies about three weeks ago, and estimates she’s had about 400 flies inside her apartment. She’s stopped eating in her apartment, and she and her husband avoid turning on the air conditioning, because she knows the insects prefer cooler temperatures. Over the weekend, her husband sneezed out a fly. “It’s been absolutely heinous,” Wolfert said. “These flies are invading my space and it makes me feel gross. I feel like I need to move out, clean everything, and then move back in.” The trickling filter has been in operation since 1981, and this is the first instance of a fly infestation, according to city officials who say they’ve been working with entomologists at Texas A&M to create an integrated pest management plan. The entomologists say the swarm of flies is a result of the long, warm spring. Chris Keefer, research scientist with the Center for Urban and Structural Entomology at Texas A&M, said the fly’s life cycle is about 21 days with perfect temperature conditions, which are high ’70s and low ’80s. They prefer standing and stale water, sewage, garbage and decomposing organic matter, which can collect in drains. They also lay eggs, which can hatch after all the adults seem to have been eradicated. “You can kill all the adults off but there’s always immature states at the breeding site that are continuing,” Keefer said. Roger Gold, an entomology professor at Texas A&M, said residents don’t need to buy cleaning products to kill the flies, but they should look to dry out any standing water in yards. Jurica said the city has received complaints in a two- to three-block radius from the wastewater treatment facility, and they are hoping the flies will be mostly gone next week. Trickling filters use little energy but they draw flies. However, Jake Thurmond, property manager at Royal Oaks Gardens, said he’s been hearing that for weeks. “The city has been giving us this PR mumbo-jumbo about how it’ll go away by itself, but that was two weeks ago,” Thurmond said. Thurmond said 20 residents have turned in pest control requests, and the complex’s pest bill will likely double for the month. After several failed attempts to learn what was going on, he said, he received an email Thursday explaining what unfolded at the city facility. He said he was given no advance notice about the city shutting down the trickling filter. Jurica said the filter will not go back online because “it’s not worth the risk” after hearing back from people who have been affected by the flies. The trickling filter doesn’t require electricity, but the new effort will. To help clean the water, the city plans to use more blowers, which are big energy consumers since they run 24 hours a day.